BOULDER, Colo. (AP) — Colorado coach Mike MacIntyre carried a framed picture under his arm as he entered the room. His art work: A buffalo walking into a storm. His message: That’s the way his team feels at the moment. The Buffaloes have dropped five straight after a 5-0 start. They’ve been besieged by injuries. And now there’s a swirling report that MacIntyre’s job is in question at the end of the season. A month ago, the Buffaloes (5-5, 2-5 Pac-12) were rolling toward a certain bowl bid. Now, after going more than a month without a win, they need to beat No. 21 Utah (7-3, 5-3) this weekend or knock off California (6-4, 3-4) in the season finale to become bowl eligible. On Tuesday afternoon, athletic director Rick George issued a statement about speculation over MacIntyre’s tenure with the team. MacIntyre said he met with George two weeks ago and was given a vote of confidence. MacIntyre discussed the rumors with his team before practice — and then went out and went to work in the cool conditions, with snow piles pushed to the side. On Saturday, the forecast is calling for possible snow as the Buffaloes play their 500th game at Folsom Field. For a handful of seniors, it will be their final time to run out behind Ralphie in Boulder. The banged-up Buffaloes will be without a handful of starters, including safety Evan Worthington and cornerback Delrick Abrams. MacIntyre pointed out their injury epidemic has been an issue all season, even costing Shenault a few games. 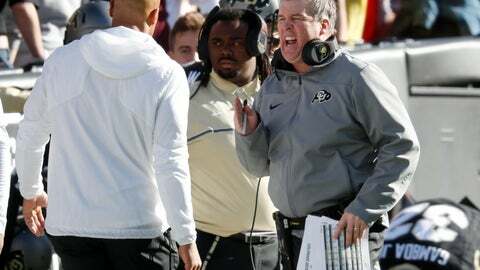 MacIntyre has gone 30-43 since being hired in December 2012 to turn around a lackluster Colorado program. He led the Buffaloes to the Pac-12 South title in 2016 and was named The Associated Press coach of the year. They fell to 5-7 last season. After jumping out to a solid start this season, even appearing in the rankings, the Buffaloes have lost five in a row. The most eye-opening: Colorado blew a 28-point lead in the third quarter to a struggling Oregon State team that ended up winning in overtime. They’re ignoring all the outside noise.